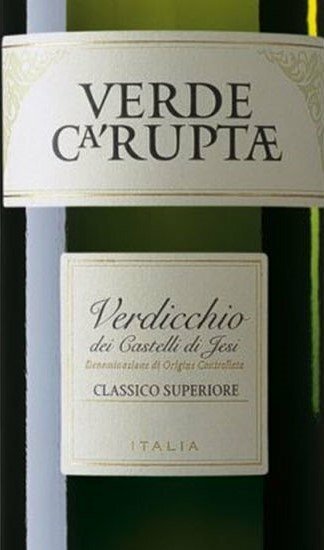 Moncaro Verde Ca’ Ruptæ Verdicchio dei Castelli di Jesi DOC Classico Superiore is a lively Verdicchio with sparkling straw-yellow colour, flecked with green and gold. The nose is a compelling aromatic amalgam of stone-fruit, wild herbs, yeastiness, pungent blackberry and acacia blossoms, with light hints of broom. Impressive for its length and intensity. The palate is lean and dry, yet round and smooth, still delicate, with good support from the alcohol. Its crisp acidity and fresh fruit, complemented by the aging on the lees, substantially contribute to the wine’s balance and its significant body. Moncaro has always been characterized by its deep roots in the territory of the Marche region and its unique environment. Moncaro sees itself as an expression of the culture of Le Marche and a representation of the heart of this land. Like many other natives of this region, Moncaro is inspired by the desire to showcase its natural beauties and the products it yields by offering high quality services with character and style, in a language the world will understand but spoken with a local accent. Moncaro is fiercely proud of this venerable land and its historic culture. And, Moncaro does all of this with a commitment to sustainable agriculture, low environmental impact & organic farming. Moncaro boasts three winemaking cellars, as well as various vineyards, in the region’s three most prestigious grape-growing areas with Verde Ca’ Ruptæ Verdicchio hailing from The Cantina di Montecarotto. Located in the heart of the classic “Castelli di Jesi” production zone, The Cantina di Montecarotto, was built by Moncaro in 1972. It comprises 800 hectares (2,000 acres) of vineyard, of which, 450 are dedicated to the production of Verdicchio dei Castelli di Jesi Classico. This is truly the kingdom of Verdicchio wine, and the Verdicchio grape is the undisputed monarch and is undeniably responsible for the finest wines of the area. Harvest method: By hand. Careful winter and summer prunings ensure balanced vine growth. Excessive fruit production is managed by cluster thinning. Multiple-pass harvesting allows gathering each cluster at its optimal ripeness. Decades-long familiarity with their vineyards and their various grape varieties, as well as constant monitoring of seasonal weather conditions, allow Moncaro to plan vinification methods and schedules before harvesting. All grapes are graded and coded according to category, sugar level, condition and yield per hectare. Vineyard notes: Growing area: Le Marche, province of Ancona. The vineyards of San Lorenzo, San Martino, & Piagge. Harvested & produced within Moncaro's Cantina di Montecarotto ("Cellar of Montecarotto"), located in the heart of the classic Verdicchio “Castelli di Jesi” DOC production zone. Aspect and elevation: sunny, partly north-facing, almost level, at an elevation of 250-350m. Skin Contact: The juice is cryomacerated on the skins, then the free-run must is separated out and gravity settled. Fermentation: Temperature-controlled fermentation with cultured native yeasts. Aging: 4 months sur lie in steel, with regular bâttonage, then bottle aged in temperature-controlled storage. Best Consumed: Delicious now. Or if you can stand to, time will bring greatness to this wine, as it expresses its full potential. 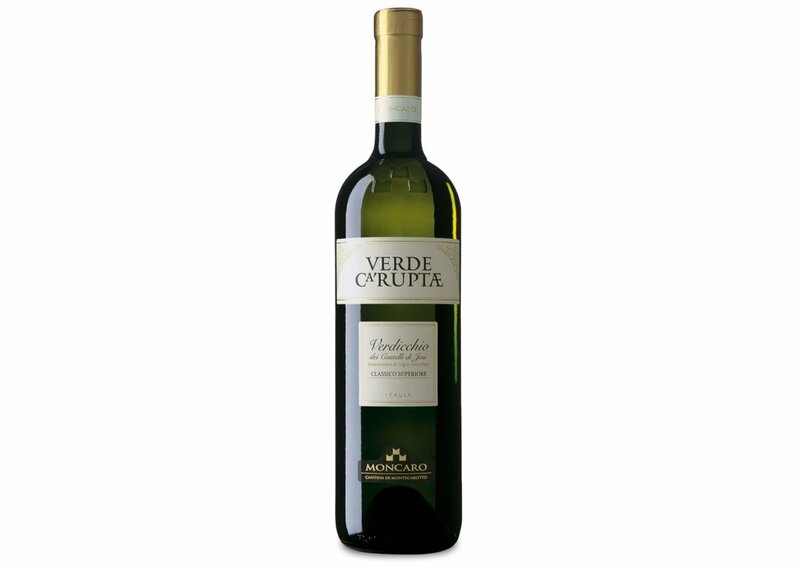 Verde Ca’ Ruptæ really is a versatile white. It partners beautifully with a wide range of dishes from rich shellfish or fried seafood appetizers to Salade Niçoise to grilled fish to seafood pastas. And although “betrothed to the sea,” it breaks its vow deliciously with poultry and rabbit. 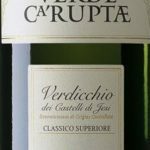 Additionally, because of its crisp acidity, this Verdicchio sings with raw fish–whether its sushi, swordfish carpaccio, crude, tuna tartare or ceviche. A perfect host/ess gift when you’re not sure what’s on the menu.